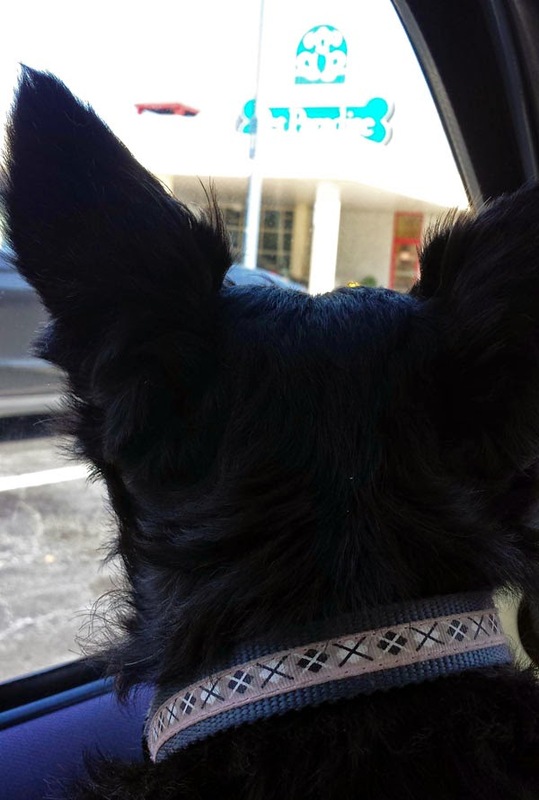 Ok, Scottie Mom - let me out! It didn't take us long to settle into our suite. Playing with a new human friend before we go meet other puppers. 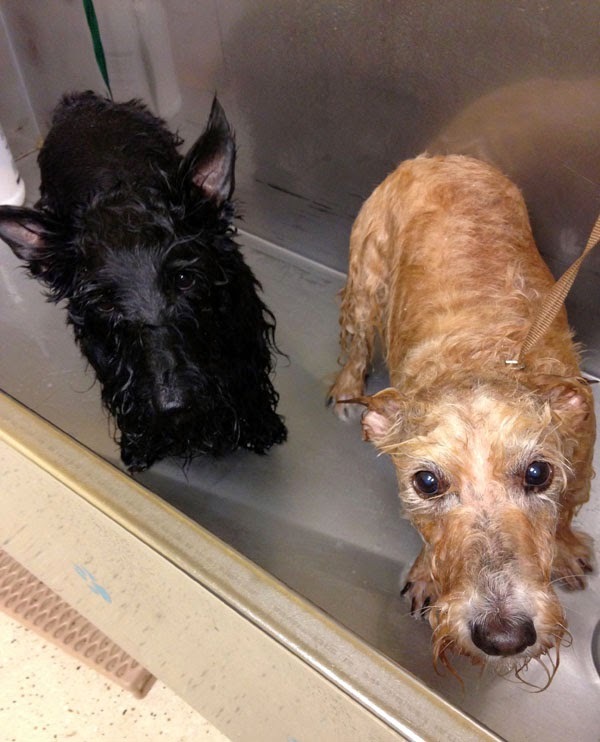 It was all fun and games...until some Scotties got a B-A-T-H.
We weren't upset too long...Scottie Mom arrived shortly thereafter to take us home! 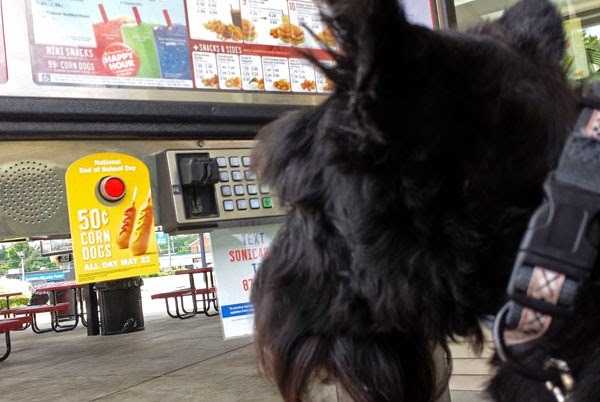 Then, because it was Mother's Day, we took Scottie Mom to the nearest dog-friendly restaurant: Sonic Drive-In and I barked in her order. ArRRrOo! I don't like to be away from Heather and Mr. K but when I have to be, it is good to know I have a place I can turn to and know that they will not only be safe but will enjoy themselves just as much as (if not more so than!) when they are with me. Initially, I was against boarding Heather and Mr. K at all costs. The only way I would vacation was if the Scotties came with us or someone I trusted could watch my precious pups. 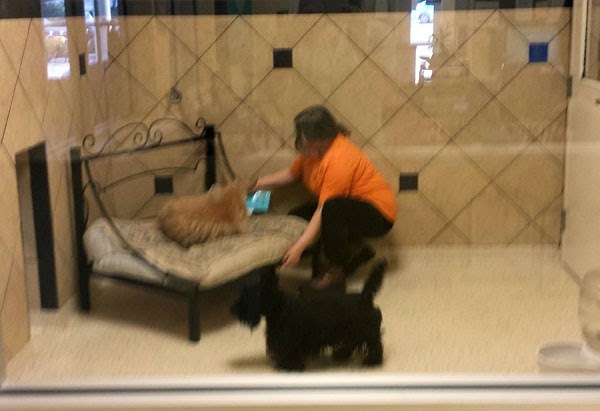 Now, thanks to a thorough (and somewhat neurotic) Scottie Mom hunt to find a place that met my standards, I have some peace of mind when I drop the fur kids off at Pet Paradise. 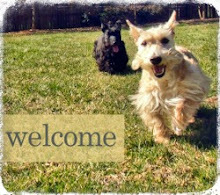 With four weekend Scottie staycations behind us - all ending with smiling puppy faces - and round-the-clock access to a web cam, it is safe to say I am over any anxiety and reservations I had before I boarded them! An added and unexpected bonus? Mr. K seems to have lost his sometimes rough-around-the-edges nature around other dogs thanks to the consistent socialization! What do you look for in a place your pups can staycation while you're away? That place looks like The Ritz! We can see why you wouldn't mind the pups staying there. I visit my vet - I love them and they love me. A bonus is they usually have some wild creature they are doctoring like a barn owl, doe, coyote, hawk...it makes for great conversation! I totally get it. Since we tend to travel twice a year it was very important for us to find the right way to have our babies cared for....finally, mostly because our pups are getting older, we opted to have someone come to house. It has worked out wonderfully! We went on a driving trip to Montana last year. That's from almost Mexico to almost Canada. They take us with Them. I don't know what's gonna happen now that Kali "Wild Child" joined us in January. We've been to Montana before and Oregon three years before that. That looks like a fancy place and we are so pleased you felt it was a good choice and we all know how difficult it is to find a place you can trust and be comfortable with. Have a terrific Tuesday. That's a VERY posh place. Our 'camp' is much more rough, but we've been lots of times and get fantastic care...that's what counts. SHE doesn't have to worry about us....or HER friends. I so wish there was a pet hotel similar to this in our area. We haven't gone on a vacation since 2007 when my mom past who was also our super fabulous sitter. I don't think I could enjoy myself thinking they were in a kennel or cage or something similar. Pet Paradise would be a different story. You are so lucky to have such a place close by. Wow - You guys are living it up at that 5 star resort (ignoring the bath of course!) - I usually go next door to Cosmo's family, but my Mum and Dad do like to research places as a backup and every now and then I stay for a night somewhere else, the key for my Mum is premises safety, and also my safety with other dogs, and of course they like me to comfy! that looks like such a great place! Woohoo y'all got to go to Sonic, oh I love me some Sonic burgers nom, nom, nom. WOW! talk about 5 paw accommodation! Mom and Dad either get our grandpawrents or our auntie Kym to look after us when they go away - which isn't too often, thankfully. Well the two of you are in it together. Through thick and through thin all out and all in ~ well you have each other in the tub. It is so nice to find a place that you are comfortable leaving your kids with. It looks wonderful! I agree, I also had a very hard time finding jsut the right place to leave our kids - which was especially problematic when it came to a 2-week honeymoon. That's just a crazy amount of time to leave them for. But you hit the nail on the head, find a place you can see webcam any time of the day or night. 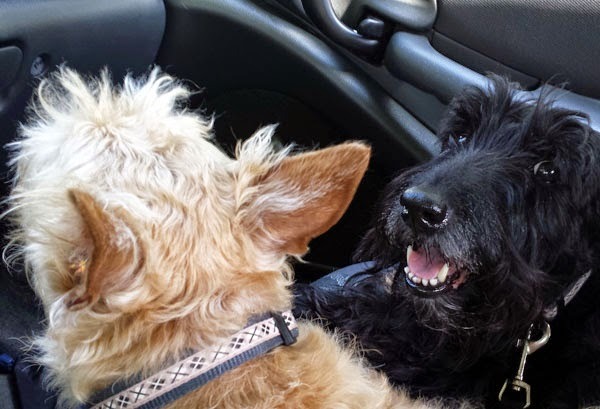 Our place also emailed pictures and recounted Mac and Maggie's adventures to us a few times during the 2 weeks we were gone. 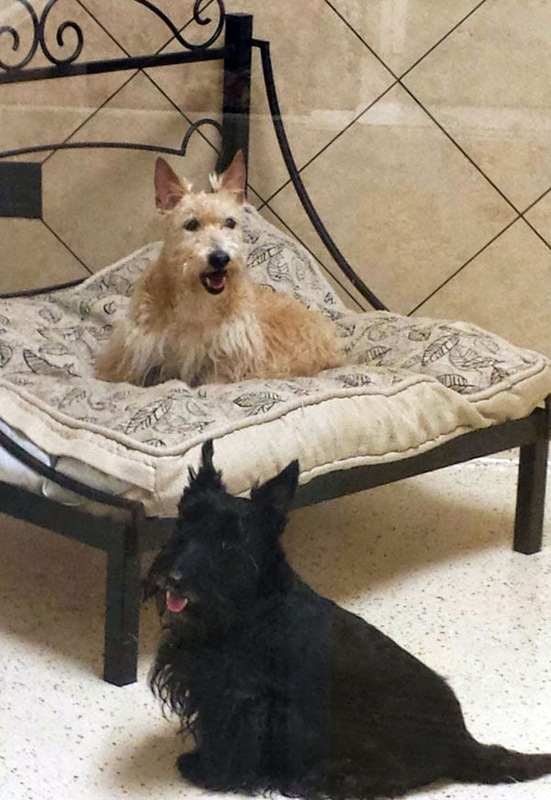 Especially important for Scotties is the socialization, so daily play groups are great! When we lived in Chicago, we had a doggie daycare service that came and picked them up and dropped them off at night. 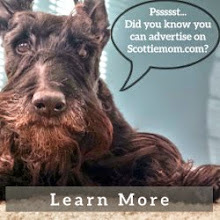 It does help our somber Scots loosen up and become Scottie clowns!